Succulent, grey-green leaves, topped with large, flat, white flower-heads in summer. 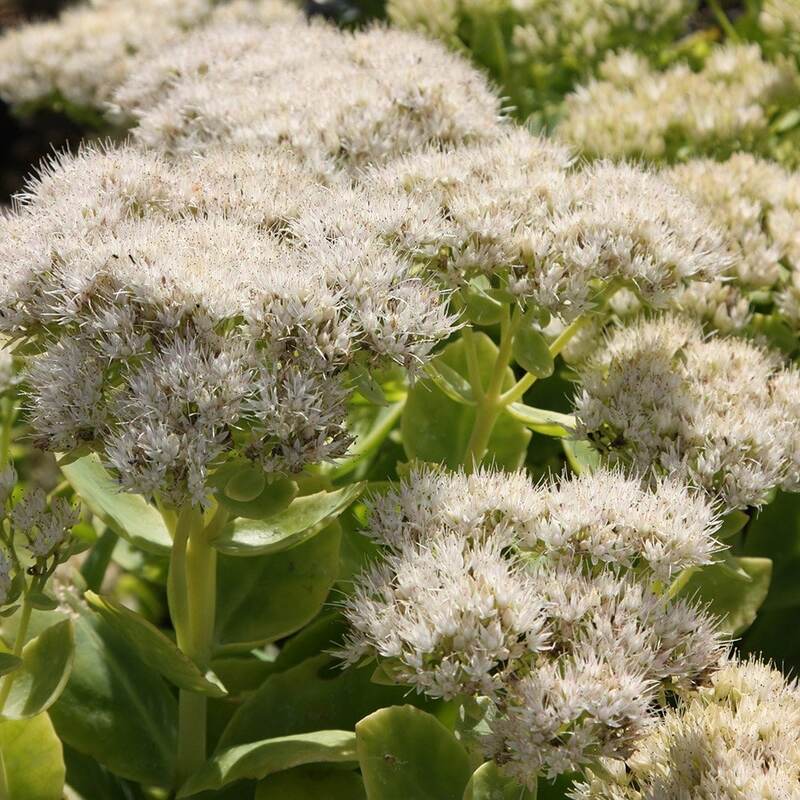 This wonderful white-flowered ice plant is a valuable late source of nectar for butterflies and bees. Occasionally producing the pink flowers of its parent Sedum spectabile, it looks great planted in bold drifts towards the front of a sunny, well-drained border. I saw Monty Don had planted 3 of these in a pot and it looked spectacular. I did it on s smaller scale and was very happy. Arguably the most beautiful Ice Plant I have seen...A truly stunning specimen, which lives up to its name well, producing a dusting of gorgeous white flowers in early September. The blooms look almost edible and are loved by bees and butterflies. The flowering season could be longer, as my first season plant only lasted a month...Hopefully this will improve as the plant matures. A wonderful plant nevertheless. Sunny well drained so far doing well as looking for repeat planting attractive flowering 'filler'. Lovely birthday gift for my friend. Lovely and fresh plant. First time I have ever ordered online but I was unable to find this plant in any garden centres I tried. Bought for a friend's birthday and I know she will be delighted with it. I will certainly not hesitate to order from Crocus again. Delivery was on my requested day and I was able to track it as it made the journey. Thank you. Ordered online and sent directly to a friend as a birthday gift. The glossy green leaves and the pretty white heads were just what was needed to fill a very sunny border. Looks good all year round and even in winter the dead flower heads add interest when covered in frost and snow.